Asparagus on the grill, Thyme for Cooking simple side dish. Prepare asparagus by snapping off the tough ends. 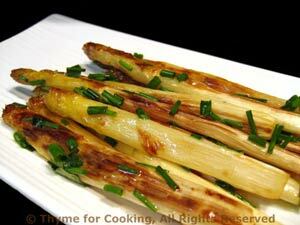 If it's white asparagus use a vegetable peeler and peel stalk end half way to tip, laying it flat on the counter to prevent breaking. Either cook directly on barbecue grill (being careful not to let any slip through, or on a mesh grill pan. Turn frequently. Should be done in 7 - 15 minutes depending on size and heat. They will start to brown slightly but stay a lovely bright color. Can also be baked at 400F (200C) for 15 - 25 minutes. When done toss with butter and sprinkle with chives. Either serve immediately or keep warm in low (150F, 65C) oven for up to 15 minutes.